Set Up Tokens and Ships: Place the eight vipers and four raptors in the "Viper and Raptor Reserves" space of the game board. Then place the fleet token on the start space of the Jump Preparation track. Last, place all other tokens (facedown) and plastic ships adjacent to the game board. Determine First Player: Randomly choose a player to be the first player, and give him the current player token. This player will choose his character first and take the first turn of the game. Choose and Place Characters: Starting with the first player and proceeding clockwise, each player chooses a character of the character type(s) that is most plentiful (political leader, military leader, or pilot). This restriction does not apply to support characters, who may be chosen at any time. After choosing a character, the player receives the corresponding character sheet and stand-up character token, as well as a piloting token if applicable. He then places his character token on the location specified on his character sheet. 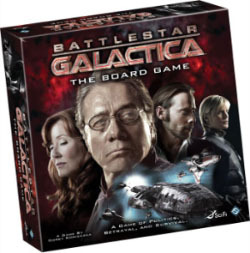 Example: The first player chooses Laura Roslin (a political leader) as his character. The next player may choose any military leader or pilot (since they are the most plentiful). He could also choose a support character. 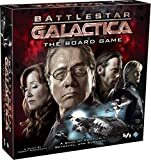 Distribute Title Cards: The President title is given to the first available player in the following list: Laura Roslin, Tom Zarek, and Gaius Baltar. The Admiral title is given to the first available player in the following list: William Adama, Saul Tigh, and Helo Agathon. The Admiral is then given the two nuke tokens, and the President shuffles the Quorum deck and draws one Quorum Card. Set Up Loyalty Deck: Set up the Loyalty deck according to the "Creating the Loyalty Deck" sidebar. Set Up Other Cards: Shuffle the Quorum deck, Crisis deck, Super Crisis deck, and Destination deck and then place them next to the game board. Then separate the Skill Cards into five decks by type, as shown on their faces. Shuffle each deck separately, and then place them (facedown) below the matching colored regions at the bottom of the game board. Lastly, place the Kobol Objective Card faceup next to the Destination deck. Receive Skills: Each player, except the starting player, draws a total of three Skill Cards from among any of the cards he can draw during his Receive Skills step. The starting player does not receive Skill Cards now, but will draw Skill Cards at the start of his turn. Create Destiny Deck: Deal two Skill Cards of each skill type facedown onto the "Destiny deck" space on the game board and shuffle them thoroughly. Set Up Ships: Place one basestar and three raiders in front of Galactica. Then place two vipers below Galactica and two civilian ships behind Galactica (as shown right). The object of the game for a given player depends on which team he belongs to. A player's team is determined by the Loyalty Cards he receives throughout the game. All human players win the game if they travel at least eight units of distance (as specified by the Kobol Objective Card) and then jump one final time. All Cylon players win the game by preventing the humans from reaching their objective. They usually accomplish this goal by running the fleet out of a resource (food, fuel, morale, or population), but can also win by destroying Galactica or successfully invading Galactica with centurion boarding parties. Receive Skills Step: The current player draws the number and types of Skill Cards listed on his character sheet. 2. Movement Step: The current player may move to a different location. If he moves to a different ship (from Galactica to Colonial One or vice versa), he must discard one Skill Card from his hand. Action Step: The current player chooses one action to perform. Options include the actions listed on his location, character sheet, and Skill Cards. Crisis Step: The top card of the Crisis deck is drawn and then resolved. Activate Cylon Ships Step (if necessary): If any are in play, Cylon ships are activated according to the Crisis Card drawn. Prepare for Jump Step (if necessary): If the Crisis Card has the "prepare for jump" icon on it, the fleet token advances one space up the Jump Preparation track. If the token reaches the end of this track, then the fleet jumps. After the Prepare for Jump step, the current player's turn is over, and he hands the current player token clockwise to the player on his left. This player then begins his turn starting with the Receive Skills step. During this step, the current player draws Skill Cards according to the skill set listed on his character sheet. The player always draws the cards listed on his character sheet regardless of the number of cards already in his hand. Example: It is William Adama's Receive Skills step. He looks at his skill set, which lists 3 leadership and 2 tactics. He therefore draws three leadership Skill Cards and two tactics cards. Some character sheets list multi-colored skills known as multi-skills. When a character with a multi-skill receives Skill Cards, he must first decide how many cards he will draw from each type. The total number of cards that he draws must be equal to the number listed on his sheet. Example: It is the start of Lee "Apollo" Adama's turn. He therefore draws two piloting and one tactics Skill Cards according to the skill set listed on his character sheet. He may then decide to draw two leadership or two politics Skill Cards - or one of each - since he has a 2 leadership/politics multi-skill. During this step, the current player may move his character token to another location if he wishes. If he moves to a different ship, he must discard one Skill Card from his hand. Human characters may not move to Cylon locations, and revealed Cylons may only move to Cylon locations. Example: It is Lee "Apollo" Adama's movement step, and he wishes to move from "Command" (on Galactica) to the "Press Room" (on Colonial One). He discards a piloting Skill Card from his hand and moves to the "Press Room" location. If the player's character is piloting a viper, he may move to an adjacent space area during this step, or may discard a Skill Card to move to a location on Galactica or Colonial One and return his viper to the "Reserves". During this step, the current player chooses one action to perform. The action types are listed below, and are usually identified by the word "Action:" followed by an ability. Activate Location: The player may perform the action listed on his character's current location. Skill Card Action: The player may play a Skill Card from his hand to perform the action specified on the card. Note that not all Skill Cards have actions on them. Character Action: The player may perform an action listed on his character sheet. Note that only some character sheets have actions listed on them. Activate his Viper: If the player is piloting a viper, he may activate it to move or to attack a Cylon ship. Title and Quorum Cards: If the player has a Title or Quorum Card that provides him with an action, then he may perform it during this step. Loyalty Card: The character may reveal one of his "You are a Cylon" Loyalty Cards to perform the specified action on it. He then follows the rules for revealed Cylon players. Do Nothing: If the player does not wish to perform any actions, he may decide to do nothing during this step and proceed to the Crisis step. During this step, the current player draws the top card of the Crisis deck, reads it aloud, and then resolves it. 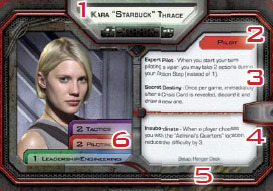 There are three types of Crisis Cards: Cylon attacks, skill checks, and events. 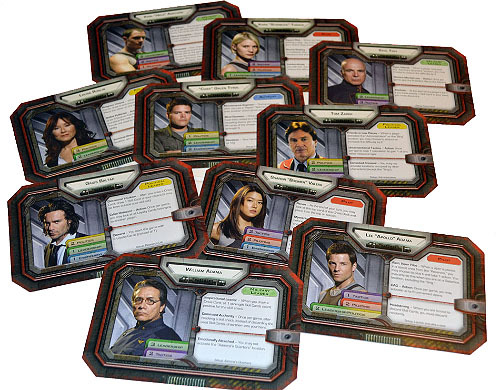 These Crisis Cards feature an image of Galactica and some surrounding ships. When resolving a Cylon attack Crisis Card, simply follow the steps listed on it. Then discard the card unless instructed to keep the card in play. These Crisis Cards list a difficulty and one or more skill types, listed as colored boxes, in the upper left corner. These cards are resolved according to the rules for skill checks and have outcomes based on whether the players pass or fail the skill check. Some of these cards give the current player, the President, or the Admiral the choice to either resolve the skill check or carry out some alternate instruction. Any Crisis Card that is not a Cylon attack or skill check is an event. These crises have instructions that must be immediately followed. Some of them provide a decision for the current player, the President, or the Admiral. If there is at least one Cylon ship in play, then the Cylon ships may move or attack based on the icon on the bottom left of the Crisis Card. If the drawn Crisis Card has the "prepare for jump" icon on its lower right corner, then the fleet token moves one space ahead (toward the "Auto Jump" space) on the Jump Preparation track. If this causes the token to move to the "Auto Jump" space, then the fleet jumps to a new destination. After this step, the current player's turn is over. He discards any Crisis Cards drawn this turn, and hands the current player token to the player on his left, who begins his turn (starting with the Receive Skills step). The four resources (fuel, food, morale, and population) are all vital to the survival of humanity. These resources are usually lost due to Crisis Cards, civilian ships being destroyed, or Galactica damage tokens. Crisis cards list resource loss as text, for example "-1 population", while tokens list resource loss as a number of red icons. For example, one red population icon means the same as "-1 population". The list of resource icons is found below as well as on the game board. Whenever a resource is lost for any reason, the appropriate resource dial is adjusted to represent the new total. The red color on the resource wheels tells players when a resource is half (or less) full, and is used by sympathizer Loyalty Cards. 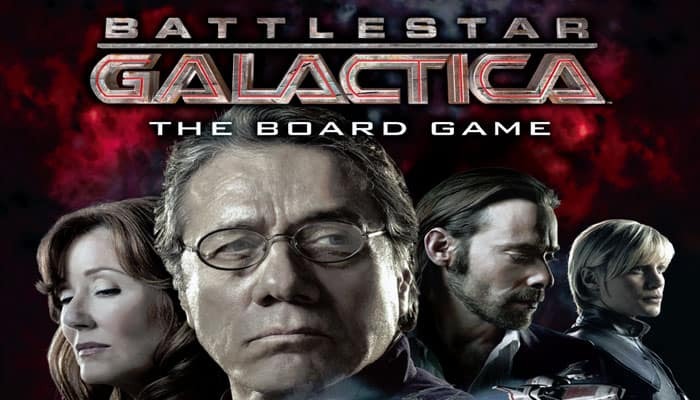 Each player takes on the role of a character from the Battlestar Galactica universe. Each character has different strengths and weaknesses as listed on his character sheet. Character Type: Each character has a type listed on his character sheet. This type only matters during setup, and exists to help players choose a well-rounded group of characters. Character Abilities: Each character has two positive abilities and one negative ability. Some of these abilities are passive (always affecting the character) while others require the player to use them as an action. Skill Set: Each character sheet lists the skills the character has expertise in. At the start of the player's turn, he gains the number and types of Skill Cards listed in his character's skill set. When a character is allowed to draw Skill Cards of an unspecified type, they must be from within his skill set unless specified otherwise. Example: William Adama is in the "Research Lab" and uses the action listed there to draw one tactics or one engineering card. He may choose to draw engineering even though it is outside his skill set, because the location specifies the card type. Setup: Each character has setup instructions on his card. This usually lists the location where the character is placed at the beginning of the game. Some characters have special instructions (such as "Apollo", whose sheet instructs the player to launch a viper and place him in it as a pilot). Each character is represented by a stand-up character token, which is used to track his location on the game board. After the character tokens are punched out, each one is attached to a plastic character stand. Title and Quorum Cards provide powerful abilities to the player who controls them. Title Cards are assigned at the beginning of the game, but may change hands through the use of certain locations or because of cetain Crisis Cards. In addition to the abilities listed below, the President and Admiral are given many important decisions to make by Crisis Cards. The President starts the game with one Quorum Card in his hand and can draw more using the President Title Card, or "President's Office" location. These cards provide special actions that only the President can perform and provide him a wide range of powerful abilities. Whichever player has the President title has control over this hand of Quorum Cards. These cards are kept secret, and there is no limit to the number of cards that may be in the President's hand. The Admiral has two important abilities. First off, he starts the game with two nuke tokens. These tokens can be devastatingly effective against basestars, but are an extremely limited resource. Second, the Admiral is the player who decides which destination the fleet travels to when jumping (see "Jumping the Fleet" on the following page). This decision can be extremely beneficial or harmful to the human players. Should the President or Admiral be revealed as a Cylon, the next player in the line of succession for that title claims it. In addition, if the Admiral (but not the President) is placed in the "Brig", then the next player in line claims the Admiral title. If an Admiral stripped of his title later moves out of the "Brig", he does not automatically reclaim the title. Note that if the President is in the "Brig", he keeps the President title and all associated abilities. Whenever a deck of cards runs out, the current player shuffles the appropriate discard pile to form a new deck. This includes Skill Cards, Quorum Cards, Crisis Cards, Super Crisis Cards, and Destination Cards. Tokens and plastic ships are limited to the quantity provided, and can run out during the game. The current player always decides the order in which a component type is placed, and if there are not enough, he decides which ones are not placed. 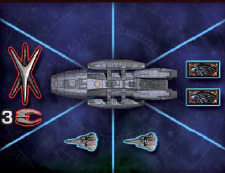 Example: A Cylon attack Crisis Card is drawn that requires two basestars to be placed on the game board. There is already one basestar on the game board, so there is only one more that can be placed. 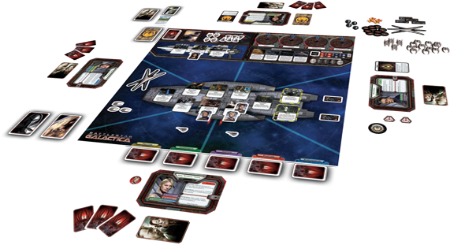 The current player decides which of the two basestars listed on the Cylon attack card to place on the game board. If all vipers are already in play and a player wishes to activate the "Hangar Deck" location, he may choose to move a viper from any space area to the "Reserves" so that he may pilot it. Some play groups may find that it is too easy for the human or Cylon players to win the game. A group may decide before the start of the game to make the game easier for the humans or Cylons. To make the game easier for the human players, start the game with 2 more of each resource (10 food, 10 fuel, 12 morale, and 14 population). To make the game easier for the Cylons, start the game with 2 less of each resource. The game ends when all human players travel eight units of distance and then jump one file time. The human players won the game in this case, else the Cyclon players won. 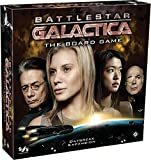 When the Galactica gets destroyed or being successfully invaded, then the game is also over and the humans lost the game.